Every time I put a Wish Token in the Wish Machine it freezes. I have to close out of WW because it is stuck. When I log back in the token has been added to my total count in the Wish Machine so at least I'm not losing the tokens. It's quite annoying to have to keep exiting out & sign back in to keep playing. This has been happening to me on multiple accounts over the past few days. 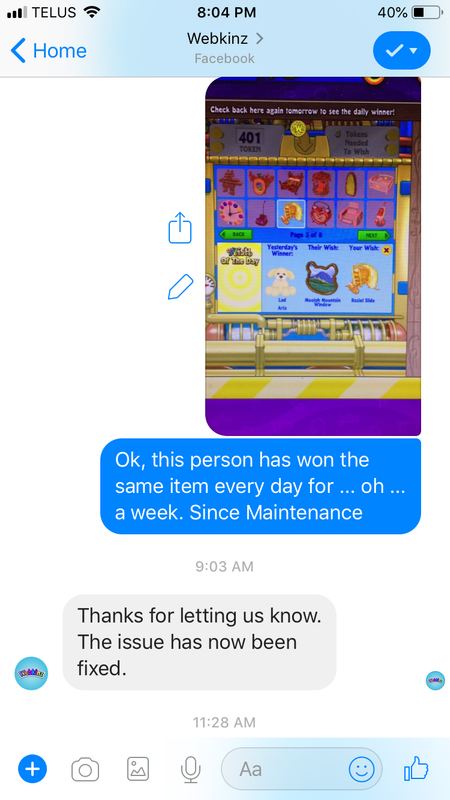 And have you noticed that the same person has won the same item, now 4 days in a row? The Wish Machine seems to be very broken. I just gave it a shot and my tokens are doing just fine. Just a bit of please wait and then she says one of her Wish machine phrases. I am using Chrome, so maybe it is your Browser? Last edited by Dixiecup; 03-20-2019 at 12:12 AM.. I use chrome too. Maybe if I let it sit for 5 minutes it would work but it's happened on at least two of my accounts now. I originally thought it was just one that was having issues. I haven't been able to figure out if one of the other daily activities is causing it to hang up. I tend to follow a regular routine when I do my dailies. I also never saw any floating pet medallions on any of my accounts yesterday. Send them a message via Facebook, it seems to work. I didn't get any tokens yesterday. Next time I get them if it still freezes I'll let them know.